It’s Throwback Thursday so let’s go back through Upper Deck’s trading card history and come up with a fun giveaway. Yesterday was National Signing Day for college football and the SEC scored many of the top prospects, including No.1. Byron Cowart announced on national television that he would play for the Auburn Tigers. Auburn has a long history of legendary athletes, and Cowart hopes to one day be included on that list. 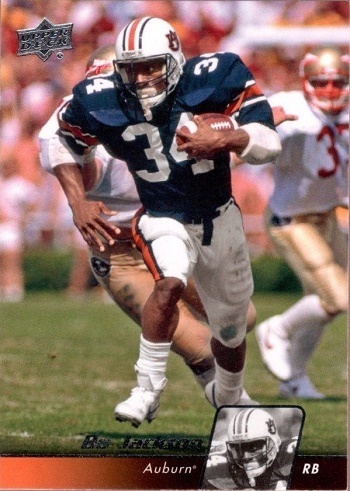 One football legend that came out of Auburn was Bo Jackson, so let’s put up a throwback card and see if our fans can come up with some great captions for the card! Please share your comical caption to this card for a lucky fan’s opportunity to score 5 packs of 2014 USA Football! You have until Friday morning, February 6th at 8:00 a.m. PTto post your caption before this promotion is closed. If you can’t catch me now son, you won’t be trying to do so in the NFL either! Missin the days i was a athlete!!! Not the days i was a criminal! Ac/Dc says on the highway to nfl! Get out of the way! Its a BO-Dozer! Bo knows how to out-run everyone, but can’t find socks that fit…. Bo knows what a good looking card is! This, kids, is what unstoppable looks like. Bo searching out his next victim. Could really use my baseball bat right now! Look! The end zone! It looks purty from back here. Run, run as fast as you can, you can’t catch me I am the Ginger-Bo Man. Which touchdown dance should I do this time? Handsy defenders should keep their hands away from Bo’s “Know” Zone! Fast as fast can be, you’ll never catch me! Oh look, they’re getting my Heisman Trophy ready! Fast as fast can be, you’ll never catch me!! Oh look, they’re already getting my Heisman Trophy ready! He could Bo all the way… TOUCHDOWN! This is to much like work. I gotta think about joining Major League Baseball. Bo Knows Upper Deck USA Football cards! That did not sound good… Where’s my right arm? No DE-FLATETING this run baby. Congrats to Matt G! Your witty comments have scored you 5 packs of 2014 USA Football! Thanks to everyone for participating and we look forward to seeing your comments again soon on the Upper Deck Blog. Yeahhhh…I’ll probably just play baseball in the Pros or somethin.